Spacious rooms, soberly decorated, comfortably furnished. The central spaces inside the house are the living room and the kitchen. The living room has a dinner table the size of an Italian family, an indoor fireplace, a wood stove, a couch and comfy chairs to relax. Next door there’s the kitchen, with granite tops and a big oak kitchen table, well equipped with a 5-pits gas stove and oven, 2 fridges, a microwave and a dishwasher, an abundance of kitchen appliances and enough plates, glasses and cutlery to serve you all. We spent considerable energy to make the private spaces really comfortable. 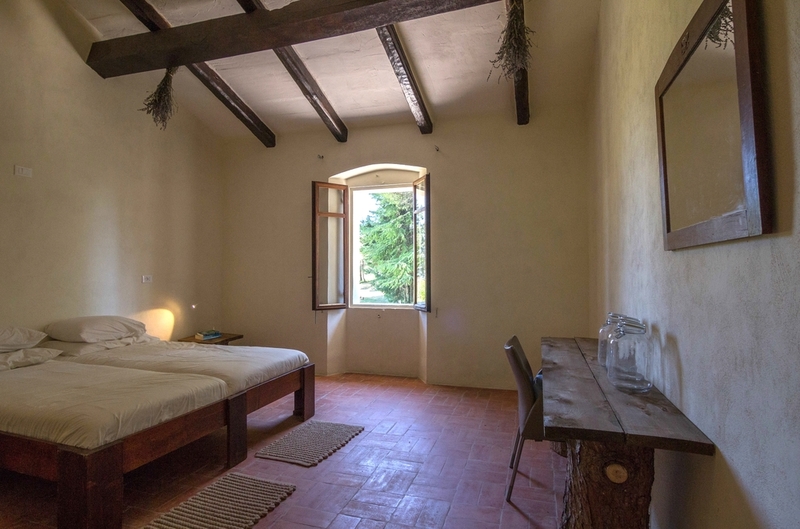 The house consists of 6 big bedrooms with terracotta floors, white walls and high ceilings. The interior is really simple, somewhat monastery-like. Beds are full sized singles, with comfy mattresses, summer duvets and fluffy cushions, all covered in clean, white, cotton linens. We used the wood of a huge pine tree that got blown over nearby to create minimalist tables and nightstands. Comfortably, there are four bathrooms, each with a luxury hot shower and toilet, with the walls and floors all done in rustic Italian ceramics. We provide guests with clean towels and, respecting the environment to which all the water we use is returned, we provide bio-degradable soaps, shampoos and laundry detergent. For groups bigger than 20 we have a great big Bedouine tent set up in the garden. Stylish, fully waterproof and furbished with exactly the same beds as inside, the tent offers a unique experience for another 6 people.